Egypt's ultra-conservative Al-Gamaa Al-Islamiya group held a press conference on Wednesday at which it categorically denied involvement in the infamous 1997 Luxor massacre. Wednesday's press conference was convened against the backdrop of a fierce public backlash against President Mohamed Morsi's appointment on Sunday of one of the group's leading members as governor of Upper Egypt's Luxor governorate. The appointment of group member Adel El-Khayat as Luxor governor prompted howls of protest in the Upper Egyptian province, with demonstrations taking place for the third consecutive day on Wednesday. Egypt's Al-Gamaa Al-Islamiya group, of which the 52-year-old El-Khayat remains a leading member, was widely blamed for the infamous1997 Luxor attack in which at least 58 foreign tourists and four Egyptians were killed. At a Wednesday press conference, however, the group categorically denied its involvement in the incident, asserting that Islam strictly forbade the killing of innocent people. "El-Khayat has never been charged in any political case or imprisoned for a single day," group spokesman Khaled El-Sherif said. He slammed perceived attempts by some quarters to exclude the formerly-militant group from Egypt's political stage. El-Sherif added that his group had reassessed its earlier policies and regretted its former resort to violent activity. Al-Gamaa Al-Islamiya was also implicated in the 1981 assassination of president Anwar El-Sadat, after which El-Khayat was sentenced without charge to one year in prison. Critics believe Al-Khayat's appointment will deal yet another blow to the country's already plummeting tourism industry, which has been hard hit by political unrest over the past two years. Luxor's beleaguered new governor, for his part, has vowed to ensure safety and security in the tourism-friendly city and safeguard its world-renowned historical monuments. On Tuesday, Tourism Minister Hisham Zaazou tendered his resignation over Al-Khayat's appointment, but Prime Minister Hisham Qandil reportedly rejected the move. Speaking at Wednesday's press conference, Tarek El-Zomor, a leading member of Al-Gamaa Al-Islamiya's Building and Development Party, slammed opposition calls for snap presidential polls as "unconstitutional." "The president does not only represent the Brotherhood and its Freedom and Justice Party, but rather represents all the people," El-Zomor said. 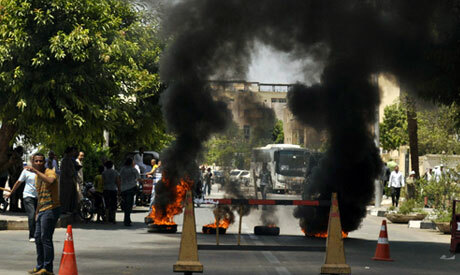 Egyptians are currently bracing for nationwide opposition protests on 30 June to demand that Morsi step down. I won't spend another dime in Egypt until the terrorist that is governor is removed from office. International travel agants are already cancelling bookings and refusing to take more. This is verification that the MB are the same as The Taliban. They could not care less what happens to the people of Egypt or Islam. They care about power.